Late last year, Steve Richard and I had an idea for new research. This would be the third collaboration between The Bridge Group and VorsightBP (after Sales Speaks and Mythbusting Millennials). Our intent was to survey sales reps, front-line managers, and directors to understand the current state of sales management. By asking similar questions and capturing the variations between their perspectives, we knew there was a story to be told. 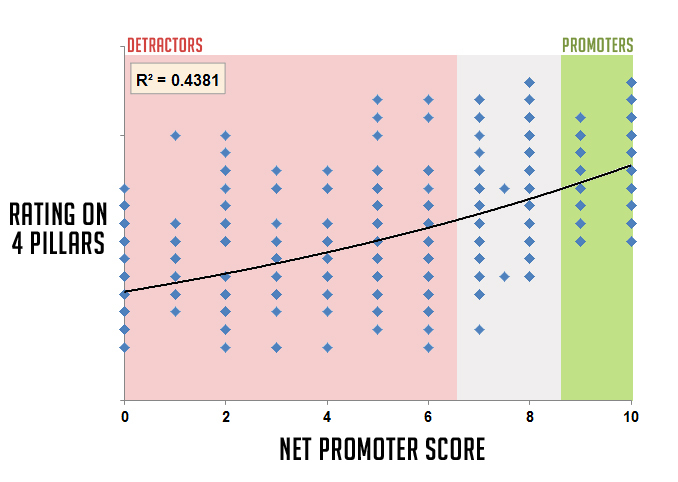 As a measuring stick, we decided to include a Net Promoter Score question in the individual sales rep variant. Finding #1: Our sales reps are not happy. Finding #2: We identified 4 areas that separate Promoter from Detractor reps.
We’ve come to think of these as the Four Pillars -- career path, coaching, compensation & professional development. These are the questions your reps are asking themselves. You, as a manager, need to be ready to respond. Finding #3: Reps whose managers (and companies) are addressing 'the four pillars' are 5-6 times more likely to be Promoters. Here's a sample of 622 reps. Notice the trend: better at the four pillars, a higher percentage of promoters. This project revealed a disturbing question: Are we a generation of Managers or Leaders? The distance between these two accounts for much of the gap between Promoters and Detractors. Now is the time to address this and I hope you'll take a look at the ebook and add your comments. Let’s help each other move our industry and profession up and to the right!